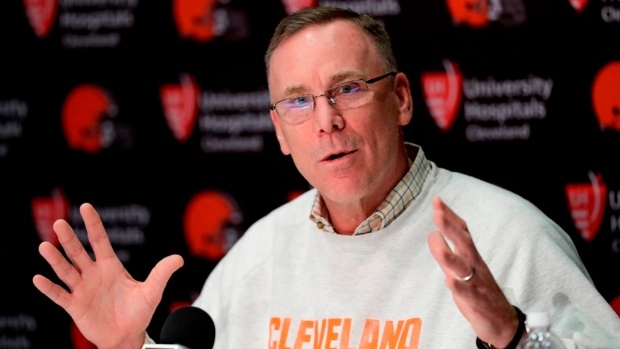 CLEVELAND — John Dorsey's roughest week running the Browns will close with a reunion. On Sunday, Cleveland's first-year general manager will get an up-close look at the team he helped build into a Super Bowl contender playing against the one he's trying to revive after years of decay — and just days after another coaching clean-out. Dorsey served as Kansas City's GM from 2013 to 2017, and was instrumental in the team drafting quarterback Patrick Mahomes, who leads the NFL with 26 touchdown passes, and in just his second year, has become the face of K.C's franchise. Before he was fired by the Chiefs, Dorsey also selected running back Kareem Hunt, wide receiver Tyreek Hill and tight end Travis Kelce — a trio of options who have sped up Mahomes' development. "John picked 'em," Chiefs coach Andy Reid said this week. "Yeah. He picked 'em." The team has never given a direct reason for Dorsey's firing. On a conference call this week, Reid didn't want to get into specifics about his relationship with Dorsey or why Brett Veach was promoted to replace him. "I am friends with John. I have been friends with John. I will leave it at that," Reid told Cleveland reporters. "Things happen, and it happened. I have the utmost respect for him. You just watch how he gets that thing turned around right there." Mahomes wasn't with Dorsey for very long, but got to know him during the pre-draft process. "Dorse is an awesome guy," Mahomes said. "He is the guy who sent the pick in and got me. He is an awesome talent evaluator, as well as a guy. It was nice to get to know him for a little amount of time." In the 10-plus months he's been on the job in Cleveland, Dorsey has disassembled the team's roster, added talent through free agency and the draft and maybe found the team's franchise QB in rookie Baker Mayfield. There's plenty of work ahead, but Reid believes the Browns have the right man in charge. "I think John is going to do a phenomenal job for you guys," he said. "He has already done it. You have seen what he has done. You guys are in good hands." "That game was crazy, a lot of numbers, but I wish we'd have come out with a win at the end," said Mahomes, who passed for 734 yards. Mahomes also had another big number the Browns can't let him duplicate. "They were 20 of 25 on third down," he said. "I think if we can keep them from completing 20 of 25 third downs, then we will have a better chance of winning." Chiefs linebacker Dee Ford was the AFC defensive player of the week after sacking the Broncos' Case Keenum three times and stripping him twice of the ball. Ford has eight sacks this season and, perhaps more importantly, has remained healthy after a career marked by a series of nagging injuries in his first four seasons. "Just to see him back enjoying the game and playing at the level he is, man, I'm just happy for the kid," Reid said. "I haven't heard that but I can tell you what we tell them. It's timing and we keep it as precise as we can," Reid said. "I always ask officials beforehand if there's anything I need to tell my guys and that's never been an issue." Browns interim coach Gregg Williams raised some eyebrows by boasting he's had other chances to coach since being fired in 2003 by Buffalo. "I have had 11 letters sent in to interview for head coaching jobs," he said. "Four of them I did not even have to show up. Just sign the contract and come." It wasn't clear if Williams was joking, but he stood by his comments. The next day, new Browns offensive co-ordinator Freddie Kitchens took a playful jab at his colleague. "I thought this was going to come up, but it didn't come up and I want to address it," Kitchens said to end his first news conference. "I have not been offered any head coaching jobs."